Two days ago we were at the REWE Digital hackathon. With over 20 different teams and hundreds of participants trying to make their perfect project, it was an intense day in Cologne, Germany. We opened the hackathon with a talk about programming microcontrollers in Python and easily connecting them to Cloud for retail application. As you can see in the image below, that was certainly an exciting task. And before we go into how great all the projects were, let’s just say that the venue was awesome. The open space concept is a pretty common thing these days, but the way REWE Digital did it was fresh and inspiring. Metal, wood, and concrete met in one space, only to welcome heaps of bean bag chairs and eager developers. Every little nook and corner was an occupied by one of the team, either testing their design or trying to make it better. For the images from the hackathon, we have Andreas Schmidt from ThingForward to thank for. You can see that it’s not just a partnership we have with them, it’s a friendship. The ThingForward team uses Zerynth tools all the time, and they are very familiar with. Together we were happy to help the REWE Digital team to better understand the possibilities of IoT, and later make their projects smart and connected. More and more retail businesses are turning their eye to IoT in order to get larger sales and our programming tools are getting a lot of attention since they are so easy to use. 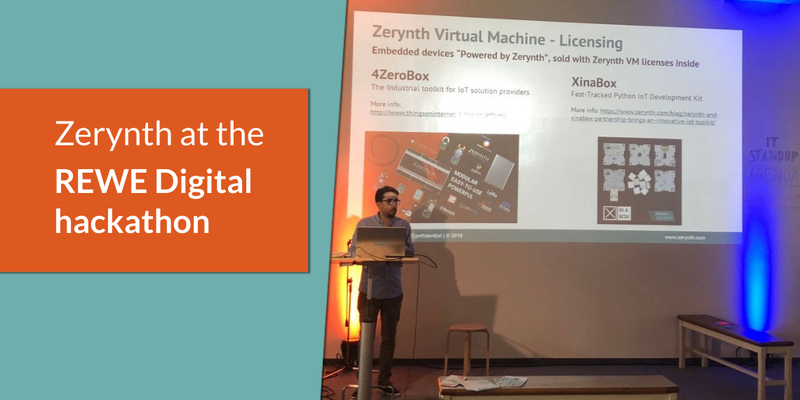 During the talk, we showed some of Smart Retail powered by Zerynth. The IoT rotating displays installed on one of the top jewelry stores in Paris are just one example. They are synchronized and interactive retail window displays that can measure customers behavior and improve their shopping experience by increasing in-store interactions. And let’s not forget the industrial refrigeration solution, an easy-to-install platform for monitoring both old and modern industrial refrigeration systems, adding typical functionalities of the IoT, without invasive interventions and apparatus replacements. It’s based on the 4ZeroBox, and powered by Zerynth. REWE Digital is responsible for handling all the online activities of the REWE Group, one of the leading retail and tourism companies in Europe. The group has over 15,000 stores and 345,000 employees over the world. Their headquarters are located in Cologne, Germany.